The law: that would be H.B. 56, Alabama’s attempt at the nation’s most rigorous crackdown on illegal immigrants. On Sept. 23, 2011, when H.B. 56 came into effect, it cut off all state and local services to the undocumented. No driver’s licenses, no registration for cars, no scholarships, no hiring without a document check. Enrolling in one of Alabama’s public colleges requires proof of legal residency in the United States. Hiring, renting property to, or simply “harboring” undocumented foreigners is illegal. H.B. 56’s one-signature provision—deputizing local police officers to turn traffic stops into deportation proceedings—assumes powers long reserved to the federal government. The law had its desired effect, sort of. Illegals did flee. Alabama reported a drop in school enrollment, especially in rural areas. This trailer and about 50 like it in a park of 300 were soon evacuated. Immigrants sold their possessions for cash and drove to Florida or California, wherever they felt safer. But Alabama’s crackdown hasn’t played out quite as expected. A group of Mexican men unloading a pickup truck explain they fled the state, but after just a month in Florida, they came back. They pointed out an obvious irony: as H.B. 56 scared off some immigrants, others found that jobs were now going begging. And these men had now rented the same trailer for less than they paid in September. If Alabama is the GOP’s latest front in the war on illegal immigration, then the battle is far from won. The tired and poor, the huddled masses, are still here, yearning to rent cheap and work hard. All the crackdown in Alabama has done is push people deeper into the woodwork. Yet immigrants remain everywhere in Alabama, hiding in plain sight, evading the crackdown with GPS strategies and shared text alerts. Family networks and the surprising kindness of strangers have given them camouflage. In this tense environment, immigrants drive slowly and stay low. “We couldn’t be more hidden,” one man says. In short, the law is immensely popular—and it’s not working very well. It has disrupted business in Alabama, and enforcement is proving costly. The state legislature last week began work on modifying the law. But modify only. “It won’t be repealed,” says a confident Gov. Robert J. Bentley, a Republican from Tuscaloosa. In one poll, 73 percent of Alabamans supported H.B. 56; Bentley notes that the measure is almost as popular nationally. “I never go on television without getting asked about it,” he says. Besides, there’s not much percentage in a Republican letting up on the issue. When Newt Gingrich suggested in a November debate that “immigration policy which destroys families” was a bad thing, he walked into a buzz saw of retribution from some conservatives. Last year state legislatures weighed 1,600 bills against illegal immigrants, and passed 300 of them, a populist wave that predates Occupy Wall Street and the Tea Party and has a powerful grip on both parties. Like earlier attempts in Arizona and South Carolina, most of these state immigration laws were blocked by courts; the U.S. Constitution reserved enforcement of the borders to the feds. Alabama H.B. 56 has provoked suits by everyone from the Birmingham Catholic Diocese to the Justice Department. And then there is an even higher law—supply and demand. Whatever H.B. 56 says, picking tomatoes in Alabama pays about eight times as much as it does in Baja. It’s not just about tomatoes, either. Local police jailed a German executive from the Mercedes-Benz plant in Tuscaloosa, and another checkpoint snagged a Japanese worker at Honda’s $1.4 billion plant. Both incidents “did grievous harm to Alabama’s reputation,” Bhargava notes. Governor Bentley has found himself assuring Chinese and other foreign investors that Alabama welcomes not just foreign investment but foreign investors. Are the toilet cleaners welcome? Carla and Ruben hide behind drawn blinds every night. They are Costa Ricans who ask to be called by new names. The apartment is cozy; their three handsome sons sit patiently on a white sofa. The couple is educated and middle class but got stuck cleaning toilets for cash in an underground economy. They work to provide for their family, they say, but haven’t seen their own parents in 16 years. Survival in Alabama 2.0: one shopping trip a week, to minimize exposure to the police. A carpool to St. Francis Xavier for the 1 p.m. mass in Spanish. (Parking at the church is easy since H.B. 56; one third of the lot is suddenly free.) When they set out in the morning, they remind their sons—the youngest a U.S. citizen—not to panic if they disappear. Move to your aunt’s apartment, the parents say. Stay in school. We’ll call you when we land in Costa Rica. The couple recalls one of the houses they clean weekly. The owner is a “really important” figure in Alabama whom they won’t identify. “He speaks against Latinos,” Carla notes, “but hires Latinos to clean his house.” The man threatened to fire them if they were illegals—then dropped the matter. If H.B. 56 sputters out, it may be because people in Alabama want a clean house more than they want to clean house. 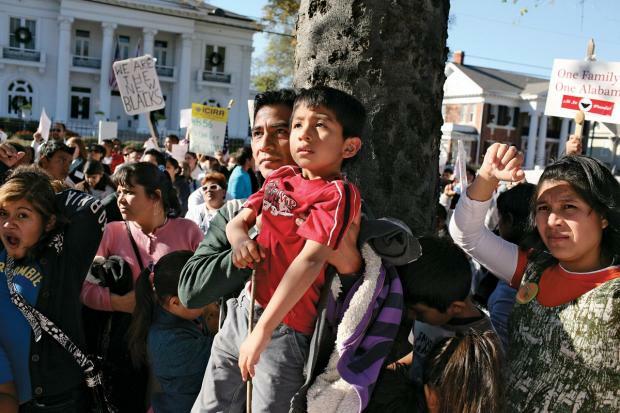 via Newsweek: Life Under Alabama’s Harsh Immigration Law.